Telephonic interview, Now a days it has become very popular. Most of the companies or recruiters are using telephonic interviews as the first step in hiring process. 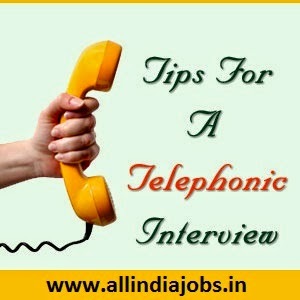 So here are the things to keep in mind during telephonic interview. Keep your resume with you or put it on some desk. So that it can be handy during the conversation. Get away from Noice or Sounds i.e. evict the kids and pets. Turn off the TV or music. Turn off the call waiting option in your mobile. Have a pen and paper for taking notes at the time of interview. Listening skill is very important during telephonic interviews otherwise you will miss out the conversation and you need to ask the interviewer again. Avoid talking in between and let the recruiter complete his thought or question before you speak. Be polite and do not use unprofessional language. Thank the interviewer at the end of interview. How to answer the basic question, Tell me about yourself? Your current company, project and responsibilities that you are handling. Technologies that you have used & Clients that you have worked etc. I want to apply your company because I interested to your company and my sip (summer internship project) work in your company sir.